Okay... you ALL can think of MANY blogs that you love to visit, right? And most of you love to find more, right? Well, Everyday Mommy is hosting Hidden Treasure 2007 Blog Awards and wants you to do just that- get out there and discover new blogs!! Then, once you find some you really enjoy, hop on over to her blog and nominate your new favorites between February 1 and February 7 in the following categories- Children & Family, Faith, Marriage, Motherhood, Homemaking, Humor, Current Events and Life. On February 8, the voting will begin. So, what are you waiting for?? Get out there and discover new blogs!! 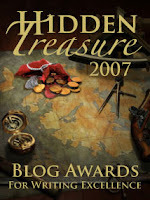 So many "hidden treasures" are out there in the blogsophere just waiting for us to stumble upon them!!! A better way to crack an egg!! !